Survivor: Philippines (2012) - 5th place, 14th out - 7th juror. 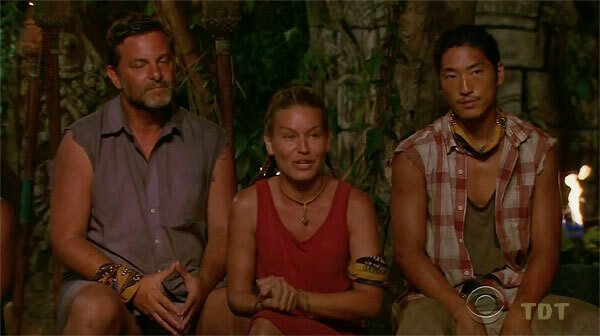 Voted out in Episode 13, "Gouge My Eyes Out" (Day 36). Survivor: Cambodia - Second Chance (2015) - 7th place, 14th out - 7th juror. Voted out in Episode 13, "Villains Have More Fun" (Day 35). Philippines Ep. 1 RC/IC: "Share the Wealth" - Does puzzle stage, Tandang blows lead, finishes second (2nd*/3). Philippines Ep. 2 RC/IC: "Manila Folders" - Sits out as Tandang wins (1st/3). Philippines Ep. 3 RC/IC: "Deep In Thought" - Sits out. Tandang finishes second. Philippines Ep. 4 RC/IC: "Swing Break" - Sits out. (Tandang wins). Philippines Ep. 5 RC: "Idol Hands" - Wins against Dawson, Tandang wins. Philippines Ep. 5 IC: "Thrash, Splash & Bash" - Sits out again. Tandang wins. Philippines Ep. 6 RC: "Bog Roll" - Not on the field yet as Tandang surrenders. Philippines Ep. 6 IC: "Philiping Out" - Sits out, Tandang wins. Philippines Ep. 8 RC: "Catch of the Day" - Part of losing team effort (with Skupin, Pete, Artis, Carter). Philippines Ep. 9 RC: "Muddy Waters" - Sits out once again, after not getting picked. Philippines Ep. 10 RC: "Snare the Drum" - Part of winning team against the oldsters (Skupin, Lisa, Penner, Denise). Philippines Ep. 7 IC, "Wrist Assured" - Surprisingly, outlasts Lisa and RC (2nd/4). Philippines Ep. 8 IC, "Snake in the Grass" - One of four people eliminated in first stage (tie-7th/10). Philippines Ep. 9 IC: "Paddle Out" - Places zero balls, tied for last (tie-4th/9). Philippines Ep. 10 IC: "Push Your Luck" - One of three (with Lisa and Pete) eliminated in first stage (tie-6th/8). Philippines Ep. 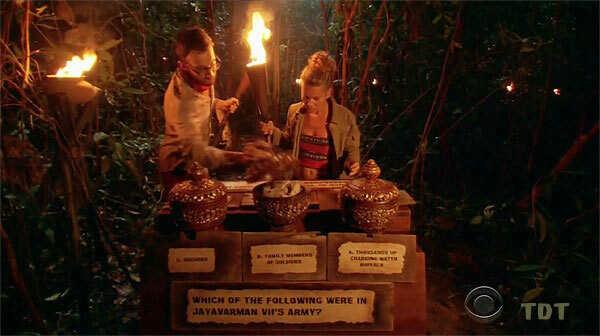 11 IC: "Brains and Brawn" - Uses her auction advantage to skip directly to an immunity win (1st/7). Philippines Ep. 12 RC: "Mud Slinging" - With her mom, knocks down zero poles, not close (6th/6). Philippines Ep. 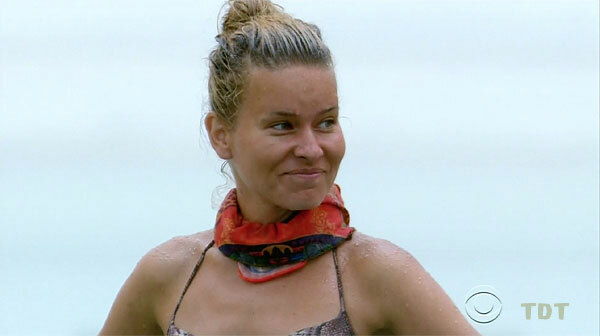 12 IC: "Fish and Game" - Barely even tries, even as Probst objects, dead last (6th/6). Philippines Ep. 13 RC: "Sliders" - Only person not to land a ring (5th/5). Philippines Ep. 13 RC: "One Track Mind" - One of four people lapped by Malcolm (tie-2nd/5). Cambodia Ep. 2 RC/IC: "Yank Yer Hank" - Crosses the barriers, watches as Ta Keo loses again. Cambodia Ep. 5 IC: "Air Raid" - Misses on her one shot, but thanks to Woo, Angkor wins (1st/3). Cambodia Ep. 6 RC: "Slip, Slide & Score" - Now with new New Ta Keo, beats Kimmi, and Ta Keo wins. Cambodia Ep. 6 IC: "Cambodian Catering" - Second to finish pig snout, but Kass can't finish, and Ta Keo loses. Cambodia Ep. 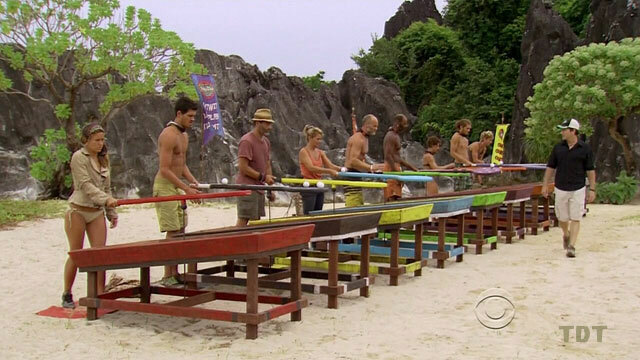 8 RC: "Boats, Brains & Brawn" - Part of the losing team, with Jeremy, Stephen, Spencer, Tasha, and Savage. Cambodia Ep. 9 RC: "Styx" - Not picked, forced to sit out, with no chance at reward. Cambodia Ep. 10 RC: "Basket Brawl" - Appears twice, scores no points, but part of the winning team, with Spencer, Joe, Tasha, and Ciera. Cambodia, Ep. 7 IC: "Hard to Handle" - Fifth to drop out, early in the second round (9th/13). Cambodia, Ep. 8 IC: "Take the Reins" - Fifth to drop out, in the first round (8th/12). Cambodia, Ep. 9 IC: "Bermuda Triangles" - Surprisingly battles Joe to the very end, falls short (2nd/11). Cambodia, Ep. 11 RC: "Folklore" - Briefly leads, ends a strong third, with four medallions (3rd/9). Cambodia, Ep. 11 IC: "The Game Is Afoot" - Partway through the final layer of blocks as Spencer wins (5th/9). Cambodia, Ep. 12 RC: "Jungle Love" - Reaches the final puzzle, adds wrong letters (tie-2nd/8). Cambodia, Ep. 12 IC: "Over Extended" - Second woman out, at the 20-minute mark (3rd/4). Cambodia, Ep. 13 RC: "Pole Dancing" - Last to cross the bridge, last place (7th/7). Cambodia, Ep. 13 IC: "Flotsam Jetsam" - Passes Kimmi at the end, but not close (5th/7). Philippines, Ep. 3: Found the idol using RC's clue. Philippines, Ep. 8: After Malcolm announces he has an idol, she also announces she has one, for no apparent reason. Philippines, Ep. 10 : Played her idol, erasing 3 votes against her. Philippines, Ep. 8: Jeff Kent (voted out, 5-4-1). Philippines, Ep. 8: One vote, from Penner. Philippines, Ep. 12: One vote, from Carter. Philippines, Ep. 13: Four votes, from Malcolm, Denise, Skupin, and Lisa (voted out, 4-1). Cambodia, Ep. 11: Stephen Fishbach (voted out, 4-3-2). Cambodia, Ep. 12: Joe Anglim (voted out, 6-1-1). Cambodia, Ep. 1: Four votes, from Kelly, Terry, Vytas, and Woo. Cambodia, Ep. 3: Two votes, from Peih-Gee and Woo. Cambodia, Ep. 11: Three votes, from Stephen, Tasha, and Kimmi. Cambodia, Ep. 12: One vote, from Joe. Cambodia, Ep. 13: Four votes, from Jeremy, Kimmi, Spencer, and Tasha (voted out, 4-2-1). yay, new tribe, don't trust Varner, etc. Tasha and Andrew have offered me a great deal. So long, old Ta Keo. Savage wins reward for Angkor! Kelly and Ta Keo win reward! The purple team... is... wrong! The loved ones are here! Gordon Holmes at XfinityTV.com (9/11/12): "Survivor: Philippines Pre-Game Interview: Abi-Maria Gomes"
Rob Cesternino at RHAP (12/13/12): "Survivor: Philippines Exit Interview: Abi-Maria Gomes"
Gordon Holmes at XfinityTV.com (12/13/12): "Survivor Castaway Abi-Maria: RC Is a ‘Bitter B**** That Got Blindsided’"
Steve Helling at People.com (12/14/12): "Abi-Maria Gomes says 'The Demon Abi Came Out' on Survivor"
Daniel Fienberg at HitFix.com (12/15/12): "Abi-Maria Gomes talks Survivor: Philippines"
Rob Cesternino at RHAP (5/9/15): "Survivor: Second Chances | Abi-Maria Gomes Interview"
Josh Wigler at Parade.com (9/2/15): "Abi-Maria Gomes Storms Into Survivor: Second Chance"
Gordon Holmes at XfinityTV.com (9/8/15): "Abi: 'I'm Going to Wait for the Right Time to Be the Villain'"
Dalton Ross at EW.com (9/13/15): "Abi from Survivor: Second Chance says 'I was a brute' last time she played"
Gordon Holmes at XfinityTV.com (12/10/15): "Abi-Maria: 'Being Real on Survivor Is Not a Great Strategy'"
Rob Cesternino at RHAP (12/10/15): "Exit Interview with the Latest Player Voted out - 12/10/15"
Dalton Ross & Courtney Yates at EW.com (12/10/15): "Survivor Talk: Abi says that Tasha 'should have drowned'"
3 Words to Describe You: Driven, creative and charming. 1) I would bring a book to distract me. 2) I would bring a pen for writing. 3) And, I would bring a notebook to write on. Survivor Contestant You Are Most Like: Parvati – she is as charming as I am. Why You Think You’ll 'Survive' Survivor: I bring social skills and team work. I am a motivator. I will also bring a very positive energy. Why You Think You Will Be the Sole Survivor: I will bring my 'A' game! I am strategic, I am athletic and I have an ability to persuade situations to my favor. " "'I will win Survivor because I'm charming and bring a lot of sass to the table,' says Abi-Maria. (I'm not exactly sure how sass helps you win, but whatever.) Abi-Maria is actually coming to her Survivor party a few years late. 'I was supposed to be on Tocantins,' she explains. 'However they thought I was going to have an advantage over everybody else because I am from that area in Brazil.' As if the sass did not give her advantage enough!"